The flag of Norway is red with a blue Scandinavian Cross, bordered in white. The flag of Norway was formally adopted on July 13, 1821.
like the other Nordic nations such as Denmark, Sweden, Iceland, and Finland. 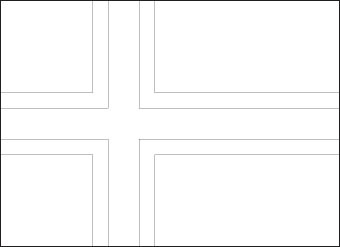 The Nordic Cross represents these nations' shared history, first used by Denmark as a national symbol, which became a tradition of the countries of Scandinavia. The cross is a symbol of Christianity. The Norwegian national flag is red, with a navy blue cross, off-center slightly toward the hoist side. The blue cross, which stretches from top to bottom and left to right across the flag, is outlined in a white border. These colors may represent freedom, drawing from the flags of France, the Netherlands, the USA, and the UK. The red and blue also reflect the shared history with Denmark and Sweden. The flag of Norway design was proposed by Fredrik Meltzer, shown with other proposals on May 4, 1821. The king approved the design for civilian use on July 13, 1821. Prior to this, the nation had used the flags of various kings, and eventually it used the Royal Standard of Norway, a red banner with a lion bearing an ax. This was based on the flag used by Erik Magnusson, King of Norway from 1280 to 1299. Norway used a shared flag with Denmark while the two countries were unified. After independence, Norway adopted the Danish flag, incorporating the Norwegian lion.